Amsterdam Hop-On, Hop-Off & Keukenhof Gardens Admission: Skip-the-Line! Enjoy 5% savings on a fantastic Amsterdam hop-on, hop-off and Keukenhof Gardens admission combo! Enjoy 5% savings with a fantastic Amsterdam hop-on, hop-off tour and visit the picturesque Keukenhof Gardens, the world’s largest flower garden! Explore a wonderland of vibrant flowers with skip-the-line access to the famous Keukenhof Gardens and admire millions of Holland’s famous tulips. Flowers delight, inspire and makes the world go round. And in 2019, it is this ‘Flower Power’ that Keukenhof celebrates in its 70th year. It was in 1969 that the Flower Power movement brought hippies and music together to make peace and not war. Where can be a better place to celebrate the strength of the lovely blooms than Keukenhof. As part of the theme, you will see an additional 50,000 bulbs of the wonderful tulips, grape hyacinths and crocuses laid out. So this season, say it with flowers. Valid for 24 or 48 hours, this option combines a hop-on hop-off bus service with a canal cruise. On the double-decker bus tour there is one city bus (Red) route and two boat routes (Green & Blue). Hop on and off the vehicle at will to see the sights or go shopping or stay on the bus and listen to the informative audio-guide, available in 16 languages. On your cruise, you will see lovely churches and the fine merchants’ houses built in Amsterdam’s Golden Age and experience the charming city from Amsterdam’s scenic waterways. Spring time travel in the Netherlands is incomplete without a visit to the spectacular Keukenhof Gardens. The long stretch of bulb fields consisting of colourful tulips, daffodils and hyacinths are in full bloom for a period of 2 months each year. Explore a maze of pathways lined with millions of vibrant tulips and discover ponds, brooks and greenhouses on your own. Don’t miss out on the 2019 theme of “Flower Power”, which has early 1970’s vibe. 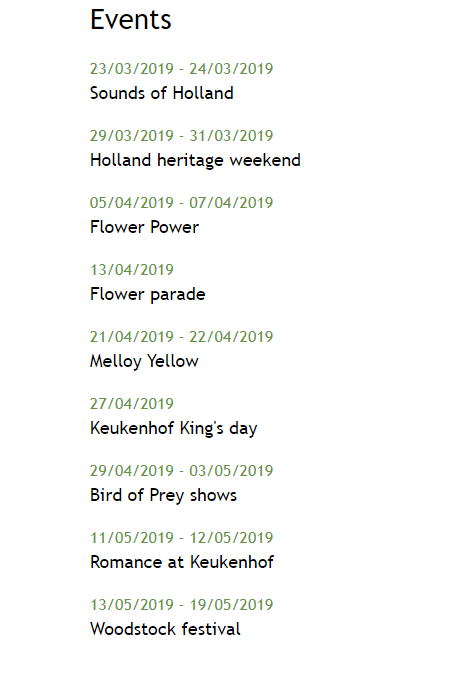 A great theme for celebrating the 70th Keukenhof. It takes back to the days of peace and music that was an important characteristic of the Flower Power festival in 1969.